In 2012, Ryan Holiday published “Trust Me I’m Lying” about his career as a professional media manipulator. His job was to get stories onto the front pages and headlines of major news outlets, true or not, to promote products or narratives that he wanted to be circulated. Since media is so hypercompetitive and fast paced, journalists can’t afford to fact check all of their sources and information. They need to get their articles out as quickly as possible to stick to deadlines and make sure they get the scoop, so if they spend too much time being careful, they miss out. And because there is so much going on to report about, journalists have to rely on bloggers for some of their stories, letting stories from smaller, more focused blogs “trickle up” to big publications. So if the blogger hasn’t done their research, and the journalist doesn’t fact check it, you can end up getting absurd stories featured on CNN or Huffington Post. A clear recent example of this is the Google Memo. It started out being mischaracterized by Gizmodo, and that mischaracterization swept through every major news outlet in a matter of days. As I outlined in my article on it, the majority of these sources grossly misrepresented its arguments, choosing instead to call it an anti-diversity sexist screed. What was remarkable about the Google Memo incident was that it was a rare case where the majority of news outlets were reporting on it falsely, and we all had the truth in our hands. Anyone with a basic understanding of science and a high school level reading ability could see that there was a big gap between what was in it and what was being reported, but plenty of outlets continued misrepresenting it anyways. It was a perfect example of the phenomenon Holiday discussed: outlets need to report on a story as fast as possible, so they get their article up as soon as they can and figure they can make updates later if necessary. It’s been easy to laugh at Trump when he rants about “fake news,” but as more events like this happen, “fake news” is becoming less of a crazy term. 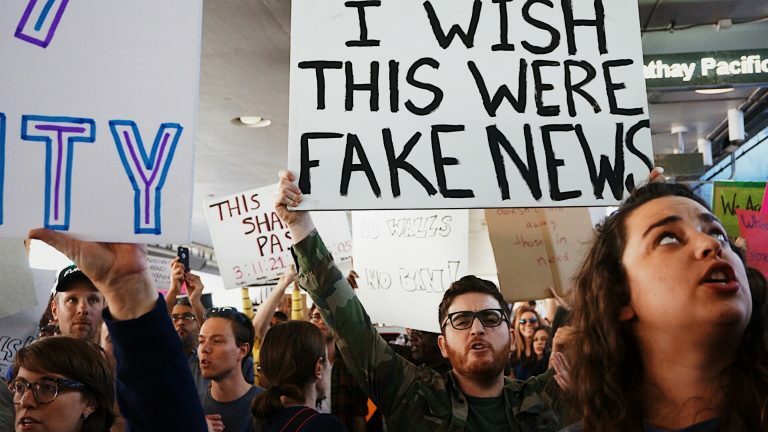 News certainly isn’t fake in the way he portrays it–I think we can still generally trust the New York Times–but some portion of news really is false, or at least badly reported. Let’s take a more fun example: bacon. In 2015, a report from the WHO came out classifying processed meats as a “Group 1” carcinogen, “based on sufficient evidence in humans that the consumption of processed meat causes colorectal cancer.” That’s the same carcinogen group as tobacco. Everyone promptly freaked out and started publishing articles saying that “bacon causes cancer” and that it’s as bad for you as smoking, but almost all of them misinterpreted the data that the WHO was actually sharing, as explained by this breakdown from Examine. These are, of course, anecdotal examples, but I’ve been running up against this problem more and more. I’ll see a trend on Twitter, or hear something on CNN at the gym, and think to myself, “that doesn’t sound quite right.” And sure enough, when I dig in on the data, it’s rare that how it’s been construed in headlines and shared articles is the full story. Something has been misinterpreted, or misrepresented, or is simply wrong. The challenge is that I only catch this when I’m familiar with the topic. If it’s about technology, or health science, or involves anything with statistics, I can usually see where it might have been misreported, but for topics I’m unfamiliar with, I have no idea what’s true and what isn’t. That’s what makes this a little scary. Because I can see where the news gets things wrong on topics I know about, I can’t help but assume that they’re getting things wrong about the topics I don’t know about. Hurricane Irma is approaching the US right now and every news outlet seems convinced that we’re not going to have a state of Florida in a few days… but I find it hard to take it seriously. Is it accurate reporting? Or is the same desire for clickable headlines and immediate publishing leading them to overblow the issue. In this case, the news media’s tendency to overblow things and our growing recognition of this habit could be life threatening. How many people are hanging out in Key West, convinced that they’ll be fine because the news always exaggerates these topics? When everything is “breaking news,” nothing is breaking news, and it’s easier to write all of it off than to take the time to try and sift through what’s true and false. Trump’s notion of “fake news” is extreme, but the underlying concept isn’t so crazy. The news is, to an extent, fake, depending on where you get it. The Wall Street Journal seems to do a good job of keeping a level head, but as a news outlet skews towards the entertainment side like with CNN, FOX, or Huffington Post, it’s difficult to take anything seriously. The challenge then is figuring out which news sources you can trust. It’d be hard to seriously call someone who watches TheBlaze all day an informed citizen, but where do you draw the line? How do you figure out what news sources are trustworthy, and then how do you better assess individual stories on their merits? I haven’t found a great solution, which is why I generally avoid the news entirely, but I have a few ideas. If you get a basic understanding of statistics and data representation, even from as simple of research as reading How to Lie With Statistics, you will be much better equipped to rationally interpret data that’s being reported and catch people misreporting data. Organizations are likely to have some bad reporters and lazy articles, but if you find a person whose reporting you trust on specific issues, they can be a much better source of information than larger publications. I get almost all of my health news from Rhonda Patrick, P.D. Mangan, and Examine, for example, since I know I can trust them. If you can’t get an accurate lay of the land from a distance, the best you can do is read a couple stories on both sides and try to figure out where the middle is. If you’re on Twitter, following people from both sides of the aisle will help immensely. As long as the incentives exist that have decreased the quality of reporting to the point of being fake, it’s unlikely the problem will entirely go away. It’s up to us to be better consumers of information.